Old World Huntington Beach’s popular Dachshund races take on the holiday spirit with a Wiener Winter Festival and Dachshund Rescue Reunion on Sunday, December 9 from 12:00 pm to 5:00 pm. Sponsored by the Wiener Dog Store and the Southern California Dachshund Relief, Inc.,this annual event features a special doxie rescue adoption. It also features two racing formats, adding a small breed classification to its regular dachshund class. Dachshund races will begin at 1:00 pm and Small breed races will begin at 2:30 pm. Dogs will race through a 22-yard course as their owners wait at the finish line, calling for them with colorful toys and treats. Guests and participants can also enjoy “show and tell” time with adoptable dachshunds on hand. 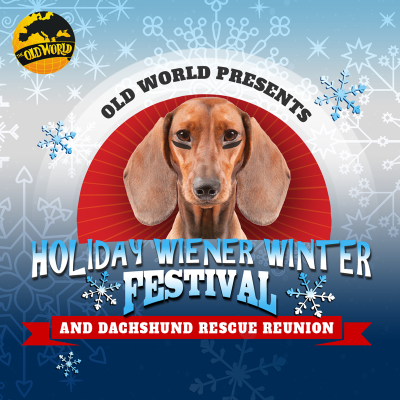 The Wiener Winter Festival and Dachshund Rescue Reunion is open to guests of all ages though visitors under 21 must be accompanied by an adult. Admission is $5.00 for adults, $3.00 for kids ages 6-12 years old, and FREE for kids 5 and under. There will also be a face painting booth, a bounce house, and other games for kids to play. There will also be delicious freshly made food to purchase and enjoy such as; bratwurst, schnitzel, slush puppies, funnel cakes and other baked goods. Anyone interested in racing their dog needs to register in advance with Inge McKellop at wienerdogstore@gmail.com or call (714) 402-7327. There is a $20.00 entry fee per dog, per race, which includes two admission tickets for the event. All dogs and pets must be kept on a leash at all times.